In the most provocative film of the year, Academy Award winner Michael Moore presents a searing examination of the role played by money and oil in the wake of the tragic events of 9/11. Michael Moore blends captivating and thought-provoking footage with revealing interviews while balancing it all with his own brand of humor and satire. 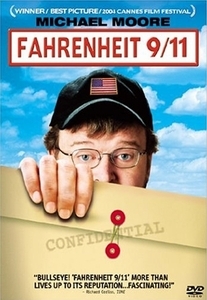 Academy Award-winning director Michael Moore examines the Bush administration's financial ties to Saudi Arabia and the bin Laden family in FAHRENHEIT 9/11, a well-researched, fast-paced, highly controversial, and important documentary that won the Palme d'Or at the 2004 Cannes Film Festival. Using actual footage and declassified documents, Moore takes a detailed look into political events both before and after the attacks on the World Trade Center on September 11, 2001, beginning with the polarizing Supreme Court decision that ultimately gave the state of Florida and the 2000 election to George W. Bush. Moore reveals how the U.S. government helped the bin Laden family return to Saudi Arabia immediately after September 11, when all other flights were still grounded; and examines military recruiting techniques in such poor areas as his own hometown of Flint, Michigan. He even attempts to get congressmen to enlist their own sons and daughters into the military. The writer-director also visits with the troops, including at a VA hospital where soldiers are having second thoughts about America's involvement in Iraq, and spends time with a family whose eldest son is fighting in Iraq. FAHRENHEIT 9/11 is a worthy successor to Moore's previous documentaries, ROGER & ME, THE BIG ONE, and BOWLING FOR COLUMBINE, once again shining a light on the past, present, and future of the US.